In July, I broke a tooth. Broke it at an angle about a quarter of the way past the gumline. I’d spent the previous three weeks in the woods teaching teenagers to push themselves through challenging experiences. I coached, encouraged, and held firm to help them learn to pick themselves up when they failed. Now it was time to walk my talk. 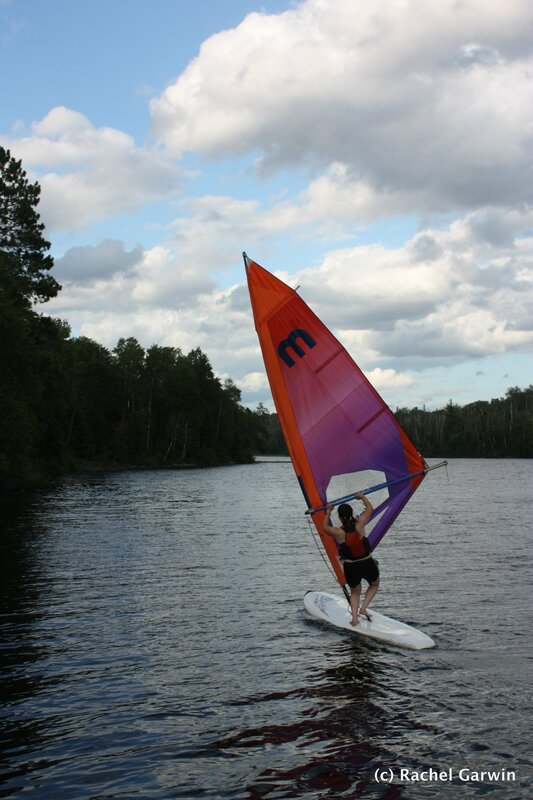 I’d never been great at windsurfing. I took a handful of lessons as a kid and played around on a board a few times since. When I took the rig out onto Birch Bay, I accepted that I’d spend most of my time in the water. I paddled out past the dock like a surfer heading for the breakers. I stood up and flexed my feet against the board for balance. I pulled at the rope tethered to the boom and raised the mast. Up came the sail, and I angled it to catch the wind. Two seconds later, water splashed around me. I clambered back onto the board and stood up again. A fierce smile lit my face. This was hard. I crossed the bay back and forth, upwind first, then down. Each time I crashed into the water, I cackled with glee. One of the true values of an Outward Bound course is learning how to pick yourself up when you fall. Here I was, floating in the water, after falling again and again. Each time I found myself no longer standing, I learned to hold the sail a little differently. I relearned that tipping the mast back to the board’s tail spun the board upwind; pointing the mast to the nose turned the board downwind. Each time the sail slapped the water with resounding force, and I tried not to think about how much it would hurt if it caught me. The afternoon passed. I was tired from all of the falling, hopping back up, and holding the sail fast in the wind. I got stuck closer to the shore than I liked, and swam the rig out ten more feet. I stood up, pulled the sail out of the water, and held it close. Too close. A gust of wind back-filled the sail, pushing it into me instead of away. I toppled into the lake. In the split second water covered my eyes, I lost track of the mast. I found it again when it crashed into my forehead and mouth. I didn’t know how bad it was, and I don’t think I wanted to. I sensed the hole immediately, and my tongue gingerly probed my upper teeth as my mouth filled with blood. I felt for the tooth remnant, but it wasn’t there. I spat, saliva thick with blood. I looked quickly into my PFD, down my shirt, into my swimsuit. Nothing. The tooth was at the bottom of the lake. I paddled the windsurfer to shore and propped it on land to keep it from floating away. I walked the path toward the Pieh Building, gingerly holding my mouth. Soaking wet, wearing orange board shorts and a long-sleeved polypro top, protected by a faded red PFD, I made a ridiculous sight. I couldn’t contain myself any longer–I burst out laughing. I walked up to my friend who was conveniently sitting on the dock. She took one look at my bloody lip and missing tooth and started laughing. “Oh buddy, what’d you do?” She fetched ice for my forehead and warm salt water to gurgle. Once the bleeding stopped, I told her the whole story. I told the story many more times that evening and the next day. I was surprised by how awesome people in the dinner line thought it was. No one pitied me, like coworkers in a cubicled office might. I was out on the lake, throwing myself at something challenging and getting up every time I “failed.” We believe so strongly in the culture of pushing ourselves that we do it in our free time. We also recognize it in those around us and celebrate them for that drive. We constantly push to make ourselves better and better, only stopping for an occasional bag of ice and a visit to the dentist.